“One Heart Many Lives” is a social marketing campaign that was developed to promote the benefits of cardiovascular risk assessment to Māori and Pacific men aged over 35 years. The programme has been very successful, increasing the number of patients presenting for assessment, and increasing their involvement and satisfaction with healthcare. What is One Heart Many Lives? What happened as a result of the OHML programme? He kokonga whare ka kitea, he kokonga ngākau e kore e kitea. ‘All corners of a room may be seen, not so the recesses of the heart’. The original meaning of this whakataukī refers to the desires of the heart. In this context the whakataukī is used to refer to the health of the heart to go alongside the social marketing campaign for heart disease. The PHARMAC One Heart Many Lives programme is about the primary prevention of cardiovascular disease. It was developed in 2003 when analysis of national data showed Māori and Pacific Island men in New Zealand, aged 35+ die 10–14 years earlier than their European counterparts. Not only do they die earlier, they do not get the right medications to treat heart disease. Activities to support the OHML programme have been focused in three key regions – Lakes, Northland and Hawke’s Bay. “Local heroes” – Bro’ files in Northland and Tamati’s story in Hawke’s Bay – have been used to motivate and encourage people to get their hearts checked and do something about it if the results are not good . Community activities, advertising and media campaigns have been used to maintain awareness. Local providers drive the OHML programme at the community level with initiatives focused around a common theme. Project teams actively promote the consistent message “Get your heart checked” to work places and general practices help to motivate and sustain the programme. Outcomes of this programme include an increase in statin use. Increased CVD risk screening, smoking cessation uptake and cost utility are other indicators being monitored. Although One Heart Many Lives targets Māori and Pacific Island men, many Māori women have been motivated to take action and get their hearts checked too. Bpac has been involved in promoting OHML in the Hawke’s Bay region to general practice. Research shows that Māori and Pacific men, aged over 35 years, rarely attend primary care; any presentation then represents a “golden opportunity”. This can be made easier by identifying these patients, setting up alerts on PMS software and being able to offer opportunistic risk assessments. At risk patients could also be invited to attend the practice for a free “heart check”. For many men in this target group healthcare is accessed only when symptoms are experienced. As many of the factors contributing to cardiovascular risk, such as blood pressure or cholesterol levels, usually have no symptoms, this can make communicating the risk particularly challenging. It is unrealistic to expect patients to make all lifestyle changes at once. Changes are more likely to occur if each individual prioritise lifestyle changes and sets realistic targets. For each lifestyle change the recommended approach is to; assess a patient’s behaviour, advise about the benefits, agree on patient centred goals, consider how your practice can assist patients attaining these goals and arrange follow-up. 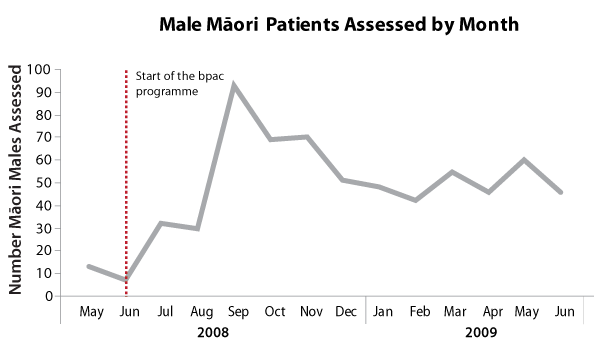 After the programme started there was an increase in the number of cardiovascular risk assessments carried out on Māori males (Figure 1). The numbers now appear to be stabilising so it is clear that continued reinforcement is needed. Many of the individuals who came in for a heart check had not been part of the healthcare system for years. This process also provided opportunities for patients with other conditions to be seen by a doctor. Feedback from practices revealed that they had found the programme very positive. They felt that the programme enabled them to make contact, and form relationships with patients who did not attend health care services, and it was positive to see patients when they were feeling well instead of only when they are unwell. Targeting the group of patients most at risk increases the health care provided to all others. In Hawke’s Bay, not only did the rates of cardiovascular risk assessment increase for Māori men, they also increased for Māori women and for the rest of the population (Figure 2). Obtain funding for free CVD/health checks – PHOs can apply for Services to Improve Access funding to support these types of initiatives. For example, some PHOs have funding for targeted health checks for Māori, Pacific peoples and those living in areas of high deprivation. Talk to your PHO about what funding is available and what services they offer. Implement practice specific interventions to encourage the target population to attend for a free CVD/health check – target patients can be identified using your PMS software. Various options exist once patients are identified, including inviting patients in for a free check, or adding alerts to patient files for opportunistic assessment. Obtained funding for free CVD/health checks. The PHO assisted in making the One Heart Many Lives project reach its full potential by using Services to Increase Access funding to make the CVD/Health assessment free to the patient. The PHO also funded follow up consultations. Developed practice specific interventions to encourage the target population to attend for a free CVD/health check. 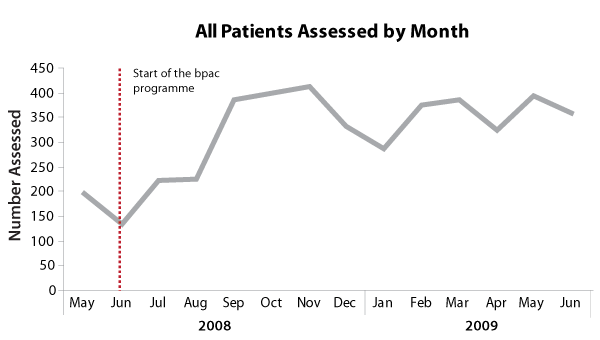 One practice phoned patients in the target group to offer free assessment. Another practice sent out invitations to those in the target group. Both reported an overwhelming response and had very few patients decline the free check. CVD assessments were conducted by practice nurses using point-of-care testing, to obtain non-fasting total cholesterol, HDL and glucose. These results were used to calculate an initial estimate of CVD risk. Patients preferred to have the result at the time of consultation and outcomes could be discussed immediately or referred to the GP. Karen Jacobs – National Programme Manager, One Heart Many Lives.